Do you know about Arduino Laser Security System? If you don't know anything, don't worry. Because today i will present a complete package of information about arduino laser security system. We all want to live safely. So we always try to take necessary steps to keep it safe. Now a days there are a lot of electronic gadget can be found in market to increase the security of our home and office. Some of them is like CC TV Camera, Anti Theft Alarm, Smart Door locking system etc. But today i will show you how to make a powerful Laser Security System very easily. Our laser security system is designed in microcontroller based platform. Because microcontroller now brings a modern era to develop electronics project using a few component. Also we can develop this project and can collect data for future analysis. 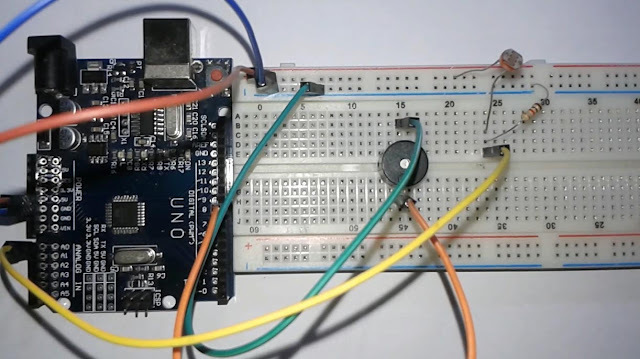 Here i have used Arduino Uno R3 for this process. 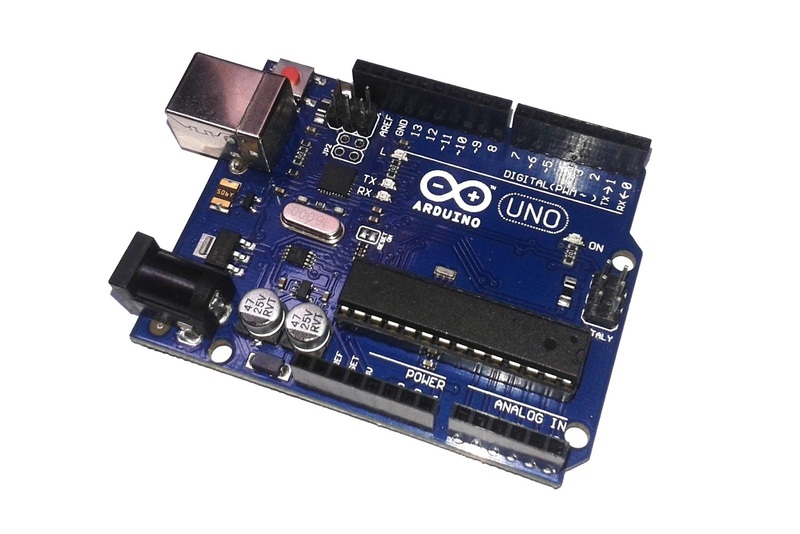 Arduino is now a popular microcontroller platform in the world. If you have a basic abc knowledge on programming you can make different types interesting project using this board. One of the best example of this is our arduino laser security system. How Laser Security System work? At first Let's know how this project work. Basically in this project we are using a special kind of light which is known as laser light. Laser is a alphabetical name. The abbreviation of LASER is Light Amplified by Stimulated of Radiation. It means Laser is the enlargement of light. But laser is not as normal light. It is a monochrome light. The light is Sharp and Thick. The laser light waves are same size. The most important feature of this light is that these lights do not spread on the way as like as normal light. This ray can be go too far as it is highly concentrated and one-way. Using this special power of laser rays, we will basically create our arduino laser security system. Many of you have heard about Dark Sensor. For those who did not listen, there is a photo diode in this dark sensor circuit called LDR (Light Depending Resistor). It works like a normal conductor when it lamps up on LDR. Again if there is darkness then electricity is prevented to flow. Using this feature of LDR, we will create our project. Some of you have already got the idea about the project. But there is no reason to fear those who are still unable to understand. I'm gonna give up. We will create a circuit using LDR which will sound when it is dark. Now we will set the target of laser dot on the LDR from a distance. So the laser light will fall on LDR. In this situation the circuit will not give any sound signal. But whenever anybody wants to cross the space between the laser light and the LDR, the laser ray will be interrupted to fall on the LDR. As a result, due to the absence of light, the circuit will give sound signal. I think now the idea is totally clear to all. Ok, let's learn how to make a laser security system. Here, i am using Arduino Uno R3 Board. Because Arduino is a micro controller board. It means we can easily modify this board as our wish using computer programming. It will be very helpful to make our laser security system project more easily using little components. Procedure: Connect the all components as like the circuit diagram given below. 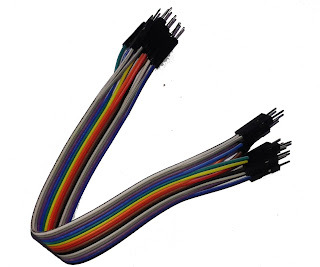 Here, i have used a arduino microcontroller board. You can collect this board from any local shop. I have collected my arduino board from Amazon. You can collect all other components from here. The connection of this circuit is very easy. At first i have connect the one leg of ldr with Vcc. Here Vcc means 5v. We know that ldr has no polarity. So you can connect any terminal of the ldr. 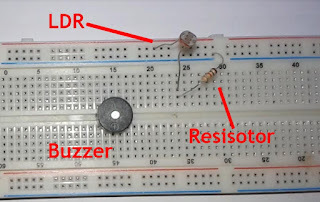 Now connect the other leg of ldr with the 1 resistor. And the other leg of resistor will be connected with the GND. Now the connection point of ldr and resistor will be connected with the A0 pin of Arduino. Now we also need to connect a buzzer with arduino for making alarm. 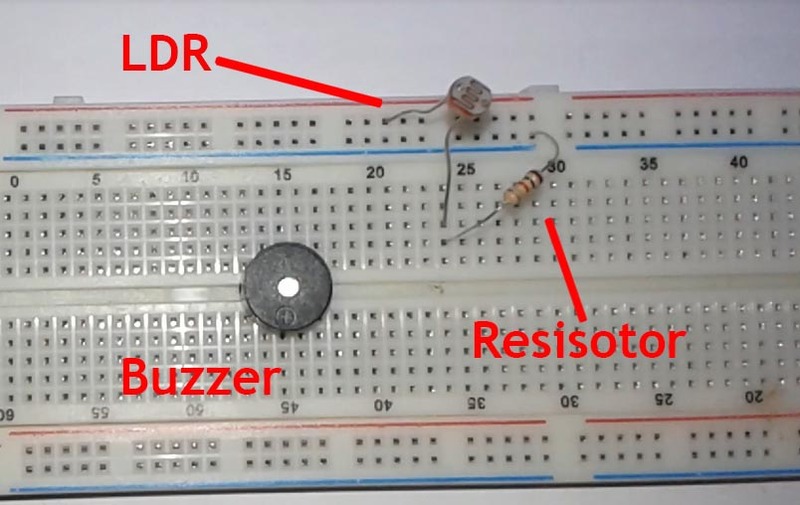 Connect the positive terminal of the buzzer with pin 12 of Arduino. And the other pin of Buzzer connect with GND. Now connect a battery with this circuit. Add another battery with the laser light. Our Arduino Based Laser Security System circuit is now ready. Now it's time to upload the code in Arduino to configure it. The code is very simple. Follow my video tutorial. Here, i have showed the full process of making circuit and explained the code. Coding: Here i have used two code in my laser security system using Arduino. The first code is for calibration. In this code i have used the analogRead() function to read the value from Ldr. The analogRead() givea a value which range is 0 to 1024. I have used this code to understand what is the value when the laser is targeted on the ldr and what is the value when the laser light is not targeted or failed to fall on the ldr. This two values help me to make a condition for alarming the buzzer. Suppose the when the laser light is focused on the ldr the output value from analogRead() is 600 and when the laser light is failed to focus then the output value of analogRead() is 200. Now we can easily make a condition that if the value is less than 400 it means that surely someone are crossing the path between ldr and laser so that the light can not directly focus on ldr. So we should turn on our arduino laser security system alarm to notice that someone is crossing the area. Else the value is normally greater than 400 means there is no obstacle or human between the ldr and laser. So the alarm will turn off. In the second code i have used the value in my condition which i calibrated from first code. If you watch the tutorial it will be more clear to you. Now it's time to use this circuit. For this turn your laser light on using battery and place it on the door frame. Place the LDR circuit on the other side of the door frame in such a way that the light from the laser light goes directly to the LDR. Now finish the job. The laser light will be interrupted if someone wants to enter the door. As a result, the Buzzer sound in the circuit will have to be sounded. I hope everybody understand this project and will be able to make Laser Security System by Arduino. I also share the video tutorial. It will be very helpful to understand this project. If you have any question about this project feel free to ask me. No more today. Stay safe and visit my blog everyday. Good Bye. The coding page does not open. What can I do?